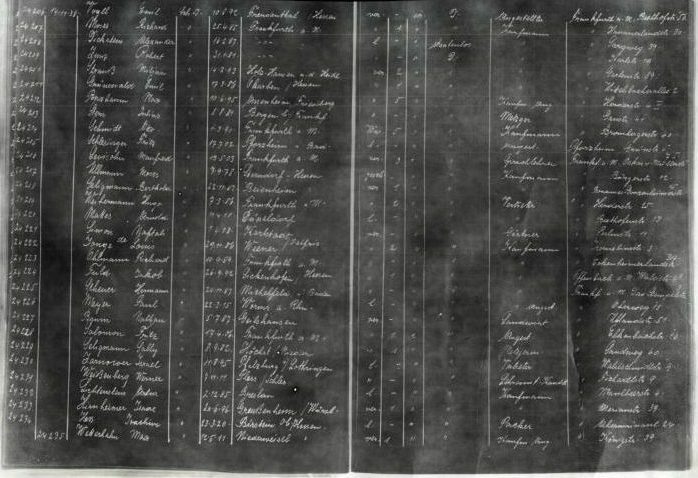 Was your relative a Jewish refugee to Britain from Germany, Austria, Poland, or Czechoslovakia in 1939? If so, they may well have found refuge in Kitchener camp near Sandwich, Kent. The aim of this website is to gather together Kitchener camp documents, letters, photographs, and histories. Having this global website presence means that Kitchener descendants who do not live in Britain will be able to join in with sharing these materials and histories. At the end of this time, the site and its public documents will be donated to an appropriate institution, to maintain these items as both materials for education and as an act of commemoration. We intend to carry out this handover in 2019 to mark the 80th anniversary of the opening of Kitchener camp. Let this be a good time to share our knowledge of these events among us. Briefly, ‘What happened afterwards’, such as onward migration or settlement in the U.K.
We are also interested in what profession the men had in Greater Germany: we’d like to see what the patterns are, if any, because one of the big questions families have is, ‘Why did my father get a place at Kitchener?’ We have a few theories, but need more solid information. So, we would welcome any note of professional or other qualifications, as well as membership of professional, technical, or social groups. The persecution of German Jews began as soon as Hitler took power on 30 January 1933. Mainly, the world stood by as, step by step, Jews were stripped of their civil and human rights, their homes, and their means to earn a living. Many Jews left Germany during the 1930s, but their capacity to do so was restricted by other countries’ strict immigration quotas, by the need to demonstrate that they could support themselves in a new country, and by requirements to pay significant leaving and ‘landing fees’. With less than a year to go before the start of the second world war of the century, from 9–11 November 1938, large groups of National Socialists (Nazis) across Greater Germany attacked synagogues, Jewish commercial premises and homes, and Jewish people. Sometimes referred to as Kristallnacht, but also known as the November pogrom, or November terror, these events finally generated some international sympathy, particularly in Britain. 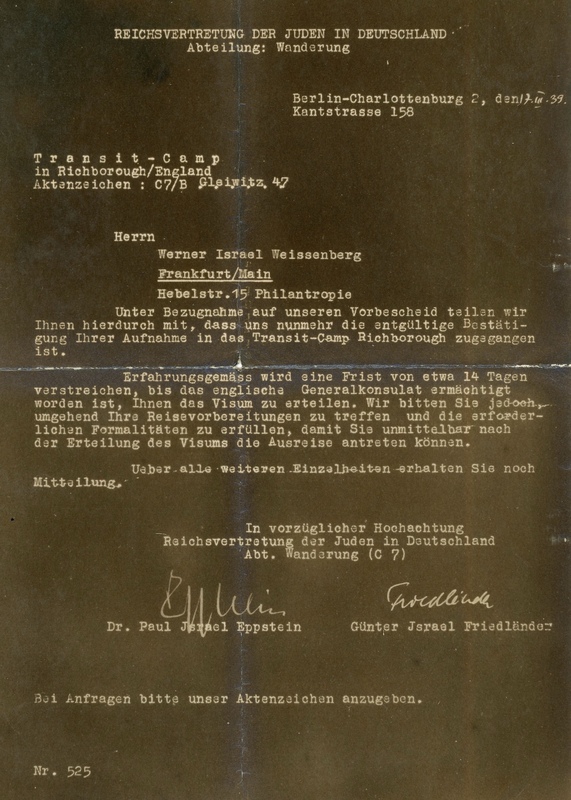 In the immediate aftermath of November 1938, the Central British Fund for German Jewry (CBF) (now World Jewish Relief) managed to persuade the British government to allow the CBF to mount two rescues of Jews from Greater Germany. The first of these rescues – of 10,000 unaccompanied children – is well known as the Kindertransport. The second rescue, which is less well remembered and documented, was of around 4,000 adult men, many of whom had been arrested during November 1938 and incarcerated in three concentration camps: Sachsenhausen, Dachau, and Buchenwald. The CBF undertook to organize transport and accommodation for the children and for the men, and to support both groups financially. It was on the promise of this financial support, and on condition that neither group would make Britain their permanent home, that the British Home Office finally gave permission for these rescues to take place. Between February 1939 and the outbreak of World War Two on 3 September 1939, just under four thousand adult Jewish refugees, all of them men, were put on trains from Berlin and Vienna. They travelled via Ostende and Dover to Sandwich in East Kent, where the CBF had rented an old First World War base known as Kitchener Camp. This camp was one of seven WWI camps close to Sandwich, known collectively as Richborough Port. 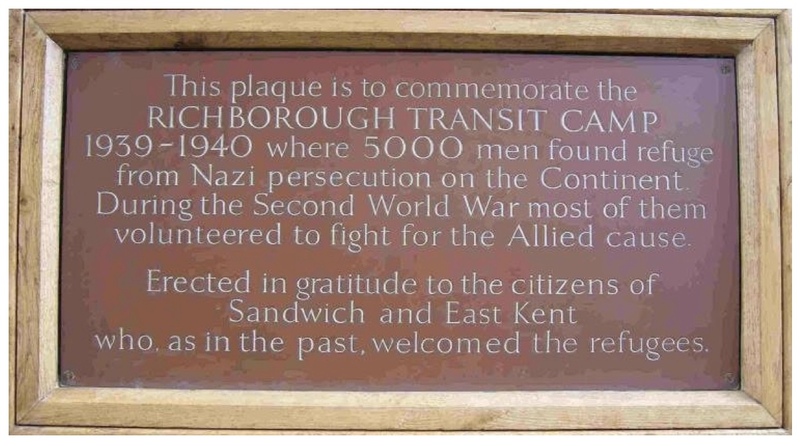 The camp itself was sometimes referred to, particularly by the Jewish philanthropists who ran the CBF, as Richborough Transit Camp. Kitchener was run by two Jewish brothers, Jonas and Phineas May. They had experience running summer camps for the Jewish Lads Brigade, but this must have been a much more demanding task – to run a camp for 4,000 traumatized men, most of whom had had to leave behind their families in the Third Reich. 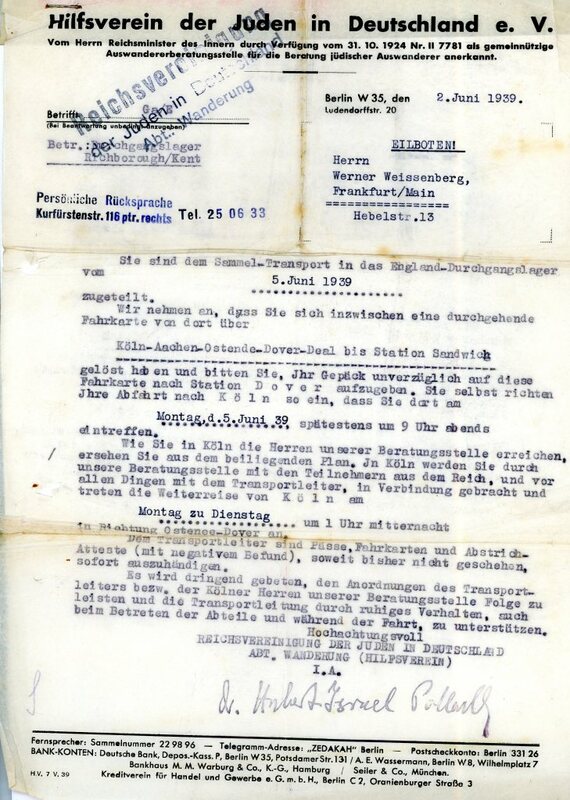 During summer 1939, a few of the men managed to get their wives and children out of Greater Germany using the system of ‘domestic service visas’ for their wives and the Kindertransports for their children. However, most families were not able to get out of Germany in time, and they were killed during the Holocaust. In December 1939, after the outbreak of war, the Kitchener men were encouraged to join the Pioneer Corps – an unarmed section of the British Army. The large majority enlisted, and most formed part of the British Expeditionary Force to continental Europe. When France fell in May/June 1940 it was thought too risky to keep a group of German-speaking refugees – or ‘enemy aliens’, as they were known – so close to the English Channel and the ports. Subsequently, Kitchener camp – as a refugee camp and as a Pioneer Corps training camp – was closed down. Most of the men remained in the British Army, but were moved to Devon; those who had not enlisted – about six hundred men – were sent to internment camps, mostly on the Isle of Man. This rescue of mostly Jewish men from Germany to Britain was to involve many mixed emotions: joy at survival, guilt at the loss of loved ones, and a wish to forget a time of such fear, anxiety, and enforced migration. This website is for those who want to remember their fathers, uncles, grandfathers, and cousins who found refuge – and their chance of life – in Kitchener camp. It is our opportunity to commemorate, document, and share this little-known refugee history.